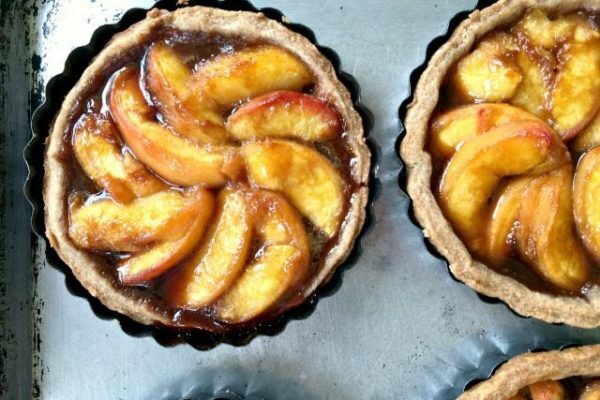 Molasses Peach Tarts are an easy and delicious way to use up ripe peaches. Yes you can make tarts. They are so much easier than pie, and you can always choose the free-form galette option if you don’t have little tart tins. 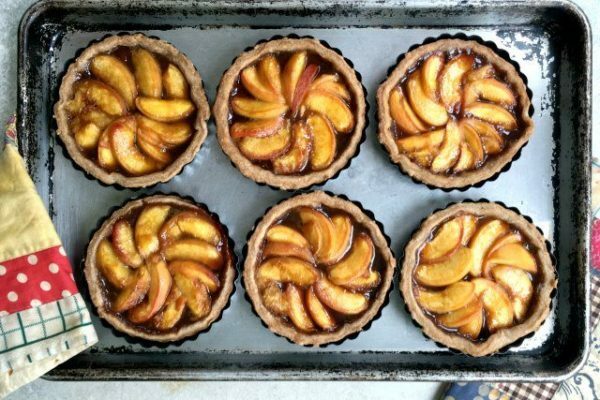 I would never turn down any fruit tart but I have to admit that Molasses Peach Tarts are especially delicious – like a mouthful of summer in every bite. And you can’t beat the texture — flaky pastry and tender peaches sweetened only with a bit of honey and molasses. These tarts aren’t drippy either, so the pastry doesn’t go soggy. 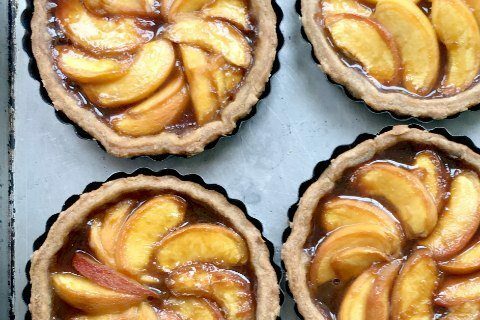 Really, these are the perfect tarts. Make them now, while fresh peaches are in the markets. Bring a pot of water to the boil. Slice a small “X” in the bottom of each peach and drop into the boiling water for 30 seconds. Remove from the water with a slotted spoon and when cool enough to handle slide off the skins. Cut into quarters and pry each quarter off the pit. From here they’re ready to slice. For this recipe I used my favourite whole grain pastry dough. 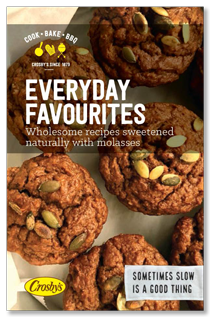 It has a bit of a nutty flavour that pairs beautifully with the peaches and molasses. Store bought puff pastry would work for this recipe. Just adjust baking time according to the pastry package. Add flours, sugar, salt & cubed butter to food processor. Process just until it resembles coarse meal. Scrape onto a lightly floured surface and gather into a ball. Pat into a disk & chill for at least 30 min. Let dough soften briefly at room temperature before rolling out. Roll out the dough to an 11 x 16 inch rectangle about ¼ “ thick. Cut 6 -5” circles. Place the circle in the tart rings*. Place on a large baking sheet and put in the freezer for a few minutes. In a small bowl whisk together the 3 tablespoon of flour and 2 tablespoons of sugar. Remove tart crust from the freezer and sprinkle the flour-sugar mixture in the bottoms of each tart. 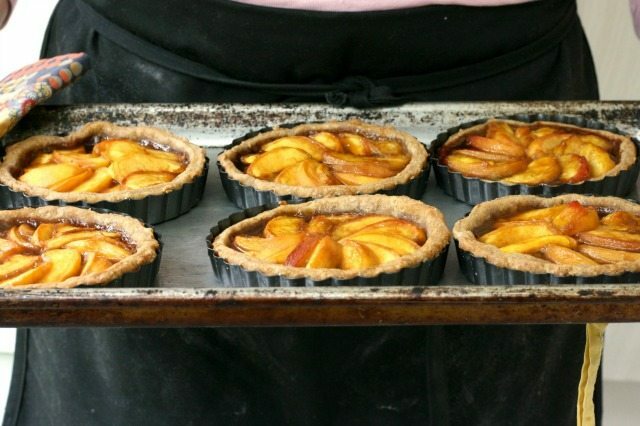 Arrange peach slices on each tart, overlapping slightly. Drizzle the molasses and honey over each one. Brush the edges of the crust with the melted butter. Place tarts (still on baking sheet) in the oven and bake at 350 for about 35 minutes or until crust is golden brown. *If you’re making the tarts galette-style, place the pastry circles directly on the baking sheet. Skip the chilling step. Instead, sprinkle the flour-sugar mixture in the middle of each disk of pastry, layer in the peach slices, leaving the outer half inch of the pastry free. Fold the pastry edge up over the edge of the fruit and overlap slightly. Continue with step #7 onward. I love August. I love how the simple act of flipping the calendar somehow makes the air feel different. I love the abundance in the markets, I love the baskets of Ontario peaches and how everywhere you turn there are gorgeous pints of plump New Brunswick blueberries. I know the summer clock is ticking once August arrives but all the same, I can’t resist all that August offers. This is an easy dessert that lets me indulge in two of my favourite summer fruits – peaches and blueberries. 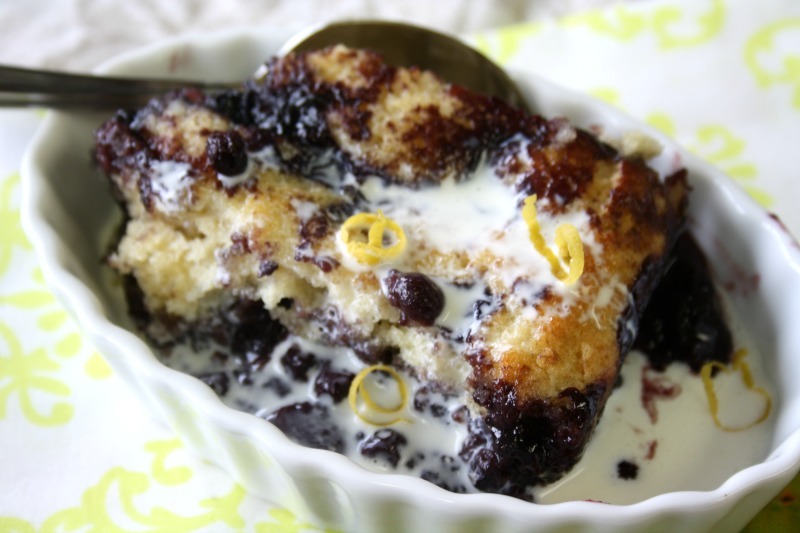 The two combine beautifully in this delicious cobbler, or pudding cake as some might call it. Eaten right out of the oven drizzled with fresh cream, every bite tastes like a warm August afternoon. The recipe can be adapted for any fruit or fruit combination and of course you can serve it with ice cream too. In a small saucepan whisk the cornstarch into the water then stir in the blueberries, peaches, molasses and lemon juice. Bring to a gentle simmer and cook 3-5 minutes until slightly thickened. 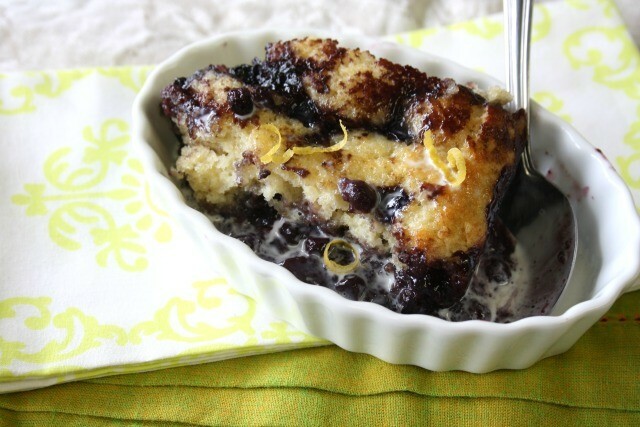 Remove fruit from heat, stir in the lemon zest then scoop out ½ cup of mixture and set aside. Pour remaining fruit into the prepared baking dish. In a large bowl whisk flour, baking powder, sugar, ginger and salt. In a small bowl whisk together egg, milk, butter and vanilla. Add wet to dry and mix just until incorporated. Pour batter over fruit in baking dish then pour extra ½ cup of fruit mixture over the batter. Bake 25-30 minutes until golden and bubbling. 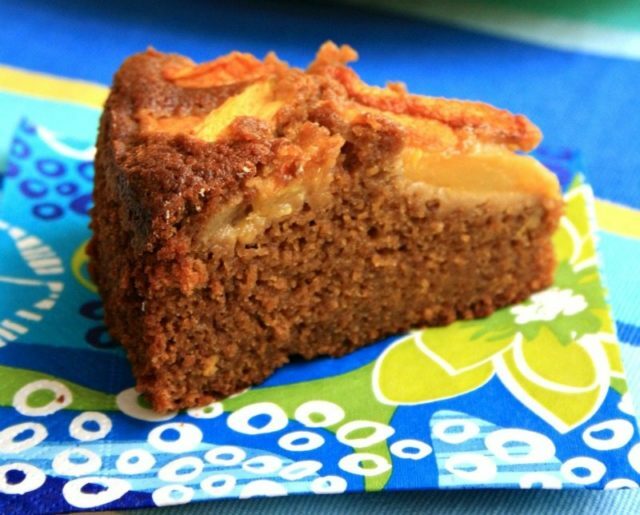 Make the most of juicy peaches with this summery peach gingerbread recipe. August is the only time of year that I eat peaches.  Each sweet bite is in many ways the essence of summer, like the taste of a warm, sunny day. By comparison, winter peaches imported from some far away place hardly seem like the real thing, with their dry woody flesh and taste of felt. In-season peaches are irresistible. Fresh from Ontario orchards, they’re so fresh and ripe that when you take a bite the juice dribbles down your chin, down your sleeve and the flesh is so tender it practically melts in your mouth. A good peach is a messy peach so I cut my kids some slack when the juice dribbles right down their legs and onto the kitchen floor. I have to be quick with my peach baking in our house since a basket of peaches can disappear in a day. I love them in crumbles and cobblers but a slice of this peach gingerbread recipe, moist and a little sticky on top, is another favourite. Stir together flour, brown sugar, baking powder, baking soda, salt and spices. In another bowl whisk together the melted butter, milk, molasses, eggs and vanilla. Add the wet to the dry and combine gently but thoroughly. Drain peach slices and arrange on top of batter. Serve on its own or with a little sweetened whipped cream on the side. 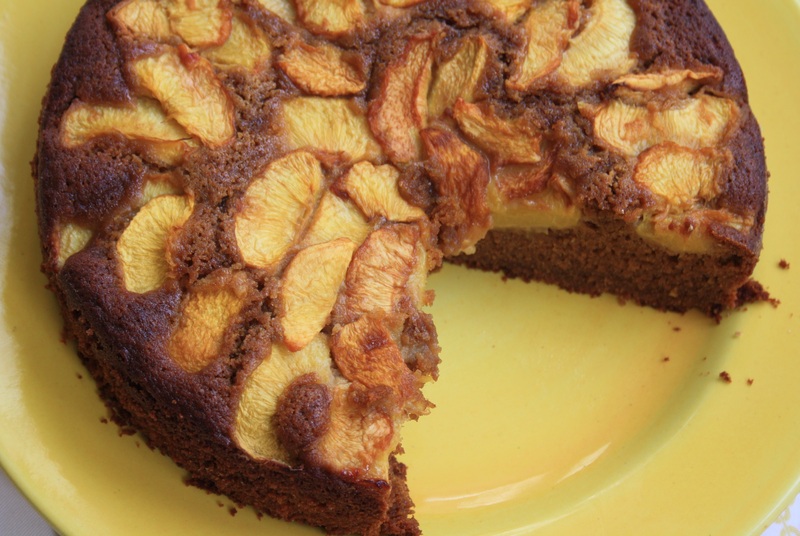 *This cake can also be made in a 9″ pan. It will need to bake longer in a smaller pan. **The juiciness of your peaches will impact the baking time. Be prepared to let it continue baking if it still seems wet in the middle. Just keep an eye on the edges of the cake, to ensure they don’t get too dark. If the edges are browning too much for your liking just place a sheet of foil over the cake while if finishes baking.